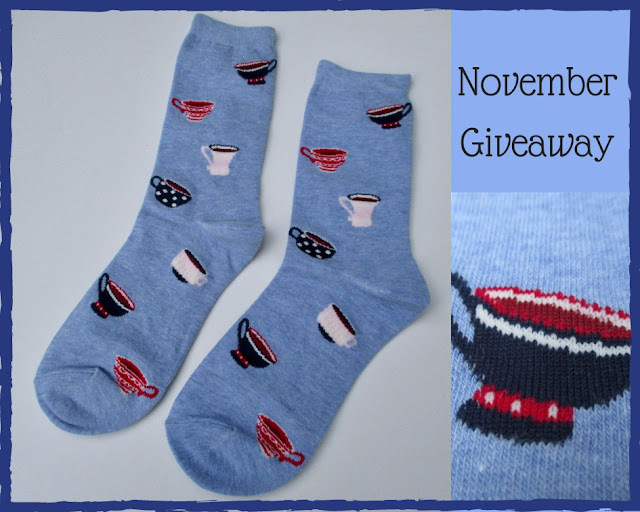 Tea With Friends: November Giveaway: Talbots Teacup Socks! 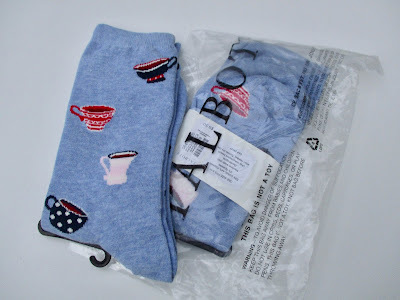 For the November giveaway, I thought one of you might enjoy the same little treat I picked up for myself last month, these new teacup socks from Talbots! I love these and got them on sale (with free shipping; always look for a deal, right?). If you'd like to win the socks, simply leave an "Enter me" to this post between now and 7 a.m. EST on Friday, November 9, making sure to include an email address so I can contact you if you're the winner, and you'll be entered to win. US only, please. Good luck! Shari Harniss in Columbus, GA. I love cute socks please enter me in your give away. Thank you. Hello Angela! Did you buy any of the other tea themed items? I was gifted the teapot/chair blouse, and I bought the teacup scarf. Unfortunately, the teapot sweater just didn’t fit. The socks were on my wish list, however they sold out. Yes, please enter me! Thank you for the second chance to have them! What fun socks!! I have cat socks, and would love to have teacup socks too!!! Please, enter me!!! Please enter me in this wonderful giveaway. These socks are just the thing for warming the outside while warming the inside with tea! Please enter me for the cute tea cup socks. I love warm cozy socks while having a cuppa tea! Please enter me! What adorable socks, I'd love to wear them! Those socks are adorable! I would love to win; thanks for the opportunity! Please enter me. Thanks for choosing such a fun item as a prize! Enter me, Please. Thanks, cute socks. Enter me! I love, Love, LOVE these! How cute are those socks. I would love winning them. You know how to find me.